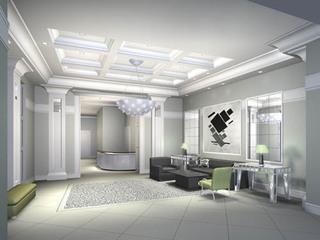 The Belvedere is a luxurious full service building that is prominently situated, overlooking the spectacular Christian Science Center Plaza reflecting pool. 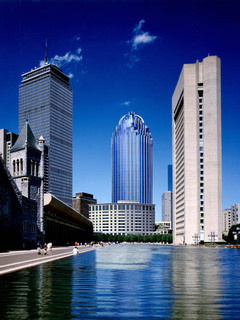 There is enclosed access to the Prudential Center and retail arcade, as well as a Shaw’s Supermarket and the MBTA (the “T”) subway station. Lobby and concierge station from the main residential entrance of The Belvedere, decorated in French Moderne style by Judith Ross and Company. 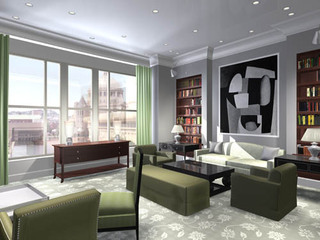 The resident’s library is located on the second floor overlooking the Christian Science Plaza reflecting pool. 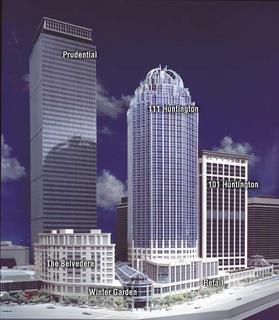 This building’s Huntington Avenue neighbors are the Prudential Center, Winter Garden, the office towers at 111 & 101 Huntington Avenue and the Copley retail stores. This full service building is the home to 61 units on eight residential floors. Unit sizes range from 993 sq ft (91 sq meters) to 3052 sq ft(281 sq meters).